A few days ago I had an opportunity to sit down with a coworker during lunch and discuss the California Seismic Principles Exam. The general consensus I have received from other people is that this test is HARD. The test is 2.5 hours long and contains 50 questions, leaving you around 3 minutes per question. The topics of the test are detailed HERE. My coworker however, passed the entire PE including Seismic Principles on his first try in April 2011. It was nice to be able to sit down with him and work through a few example problems and talk about what materials he used and how he studied. 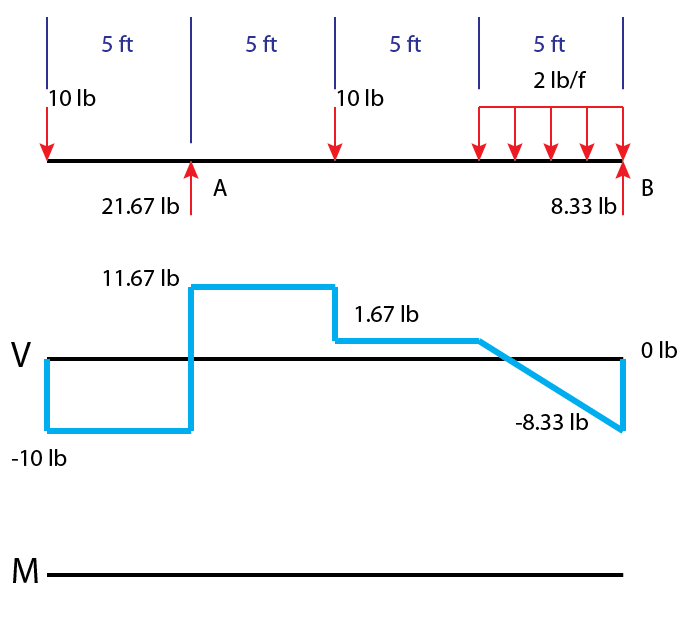 Moment diagrams are similar to shear diagrams, use them to find the location and value of the maximum positive and negative moment, or the moment at any specific location. The easiest and fastest way to construct a moment-diagram is by using the areas of the regions in the shear-diagram. Before doing this you must solve for all the reactions, and solve the shear diagram. Here is a member that is solved to the desired state to begin working on the moment diagram. The start of a moment diagram (M) is below the existing shear diagram (V).